S’mores, S’mores, S’mores. How I long to try thee. It is shameful that I haven’t tried a S’more before (I can rhyme). It’s just not something we really have over here. For those who don’t know what a S’more is let me just break it down for you. It is toasted marshmallows and chocolate sandwiched between two oaty graham crackers. The toasty marshmallow causes the chocolate to melt and you end up with a ooey gooey melty mess with the crunch from the biscuits. I have to make a real s’more soonish. Whilst scouring blogs, I come across a lot of S’more inspired treats. All of which you can find on my Pinterest board dedicated to S’mores but I have never seen anything like this before. Elizabeth from Sugar Hero takes the humble S’more to a WHOLEE new level. 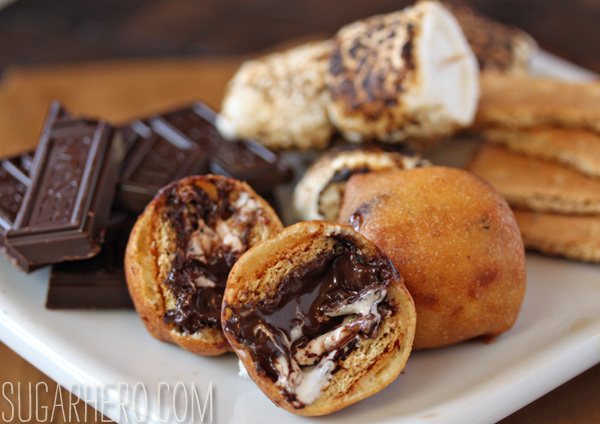 S’mores… Deep Fried? Just look at all that molten dark chocolate waiting to be devoured I HAVE to try this. This is just sheer genuis.